ADJUSTABLE HANDLEBAR AND SEAT: The balance bike features 3 Lifting Locks and quick release clamp that require no tools to tighten. Easy to adjust and fix the seatpost/handlebar in position, the seat and handlebar heights adjust to accommodate ages 18 months to 5 years, suitable for 31″ to 47″ height. LIGHTWEIGHT AND PROTECTIVE: The toddler bike is made of aluminum alloy, weights only 4.3lbs, sturdy enough to hold up to 110lbs. The aluminum frame and foam tires make it easy to transport, make your child ride and stride easily. Soft handlebar grips with safety ends offer better control and keep hands from slipping. DURABLE AND EASY: 12inch Puncture-resistant and maintenance-free EVA Foam tyres, no need to ever inflate these tyres. Work fine on pavement, playground, lawn or Trail. Roll smoothly and quietly, designed for a long lasting durability, help kids ride easily. 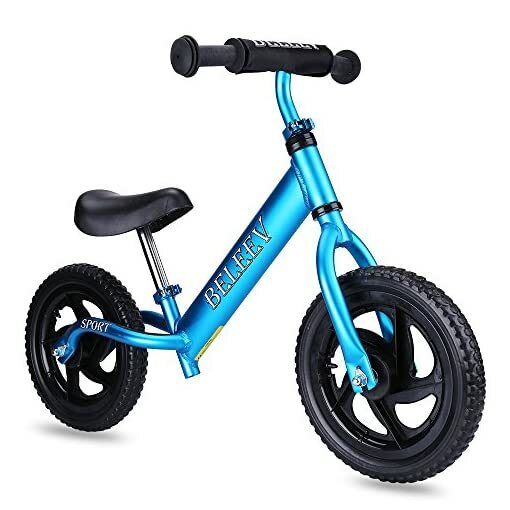 BELEEV balance bike is designed to focus on a simple goal: teach young children how to steer and balance on two wheels without training wheels. Through this approach, your child will also learn coordination and confidence. The balance bike has adjustable handlebars and seat for children from 18 months to 5 years old. It was designed as needed to accommodate your growing child. Height-adjustable seat allows the feet to reach the ground easily. The BONUS to our balance bike is the improvement to seatpost which features CREATIVE 3 LIFTING LOCKS. It offers No-Tool seat height adjustment, easy to adjust and fix the seatpost in position, greatly save your time. Design with no pedals, tiny children move forward with their feet. This approach makes getting on a bike less scary and glide the bike smoothly when place the feet on the comfortable footrests, which don’t get in the way. –For best protection, we recommend that children wear helmets and knee elbow pads when riding. –Please check the 5th PICTURE for the INSTALLATION PROCESS, ensure that the installation is correct. EASY TO INSTALL: No pedal balance bike comes partially assembled. The wheels are securely attached and ready to ride. Just install the wheels to the frame, then slide the seat and handlebar in the right position for your child, lock it down with the quick release clamps. SAFE AND COMFORTABLE: The first bike comes equipped with padded thick seat and handlebar bumper pad, providing an extra level of safety and comfort. Built-in Footrests is both comfortable and functional, prevent feet slipping when children lift their feet off of the ground in order to develop the balance needed in order to ride a pedal bike.